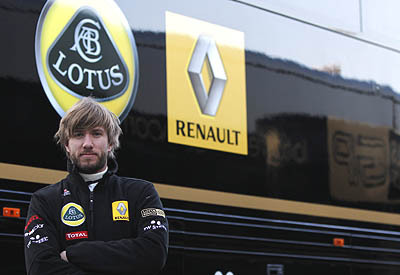 Lotus Renault GP has announced that Nick Heidfeld has joined the team, taking over driving duties from the injured Robert Kubica, starting at this week's test in Barcelona. The 33-year-old German is one of the most experienced drivers in F1 having started 172 races over the last 11 seasons. He will race alongside Vitaly Petrov when the season gets underway (fingers crossed) in Bahrain on 13 March. "I would have liked to come back to Formula 1 in different circumstances," said Heidfeld, "but I'm proud to have been given this chance. Everything has happened so quickly, but I've been very impressed by what I have seen so far in terms of the facilities and the dedication of the people at Enstone. I really enjoyed the test last week in Jerez and I've already settled in well with the guys at the track. I have a good feeling for the car, which is quite innovative. I'm extremely motivated and can't wait for the season to begin." "The team has been through a very difficult couple of weeks," added Eric Boullier, "and we had to react quickly. We gave Nick a chance in Jerez last week and he really impressed us. He's quick, experienced and is very strong technically with his feedback and understanding of the car. We always said the priority was to have an experienced driver in the car and we feel he is the ideal man for the job. We are pleased to welcome Nick to the team and look forward to a strong start to the season with him and Vitaly in Bahrain." Hulkenberg eyeing Kubica replacement role?